I must say it has taken long enough. But the temps finally dipped down to 58 the other night and the next day it was gorgeous - Open the windows, let the breezes in kind of gorgeous. And I got the fall decorating urge almost immediately. "What's with the empty frames - aren't you going to put something in them?" However they totally surprised me and actually liked them empty. You just never can figure these guys out some days. The little bronze pumpkin is a Dollar Tree pumpkin I painted with craft paint then glued some twine I twisted on to it for a vine and two drop cloth fabric leaves. The little blue pumpkin is one from years ago that I painted with blue craft paint then dry brushed with white craft paint. The center of the mantle needed something low so as not to compete with the resident book page wreath. I simply painted some old spaghetti sauce jars in antique gold, bronze, blue and white craft paints using the same method I did for these vases. These are fun to make and I am saving jars and checking out thrift store glass like crazy now. The right side of the mantel is a stack of old books sans their covers and tied with raffia, an old gold frame we had, and a tall candle stick I've had for awhile with a deep orange candle tied with raffia. The blue pumpkin is another Dollar Tree pumpkin (what would we do without Dollar Tree?) painted with blue craft paint then dry brushed with white. 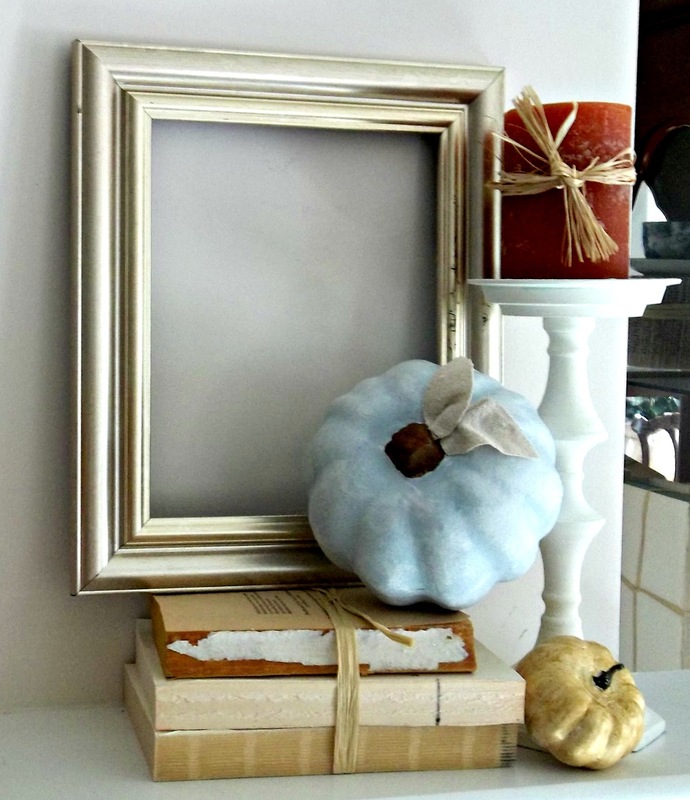 The little pumpkin is another we had that I painted with antique gold craft paint. 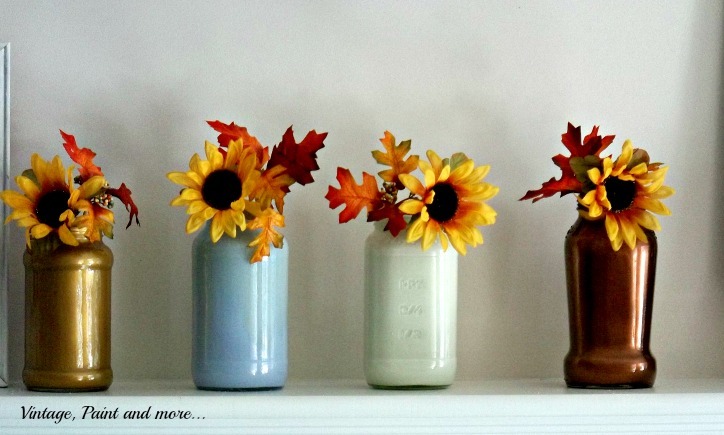 So, have you gotten your mojo on yet and started your fall decorating? Love your color combos and great vignettes! Thanks for inspiring us at TTF! the muted colors here, and the books! Love your style, it turned out beautifully. I found you at the Get Schooled Saturday link party! 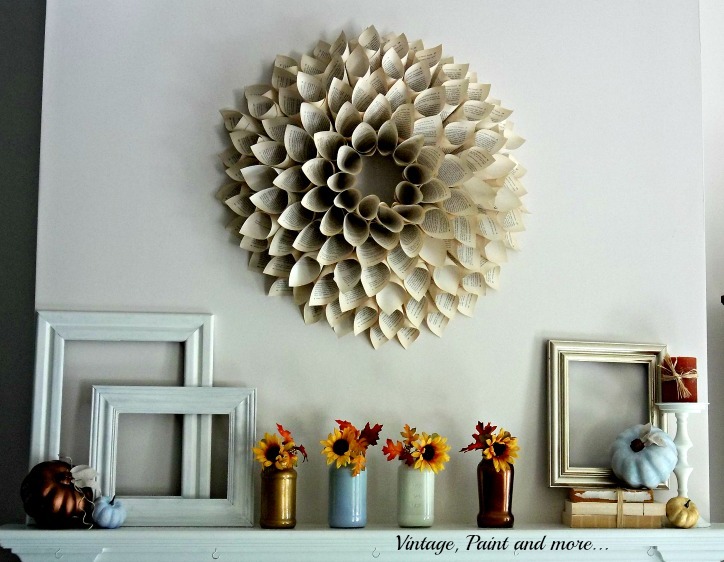 Love how you've decorated your mantel -- simple but lovely! 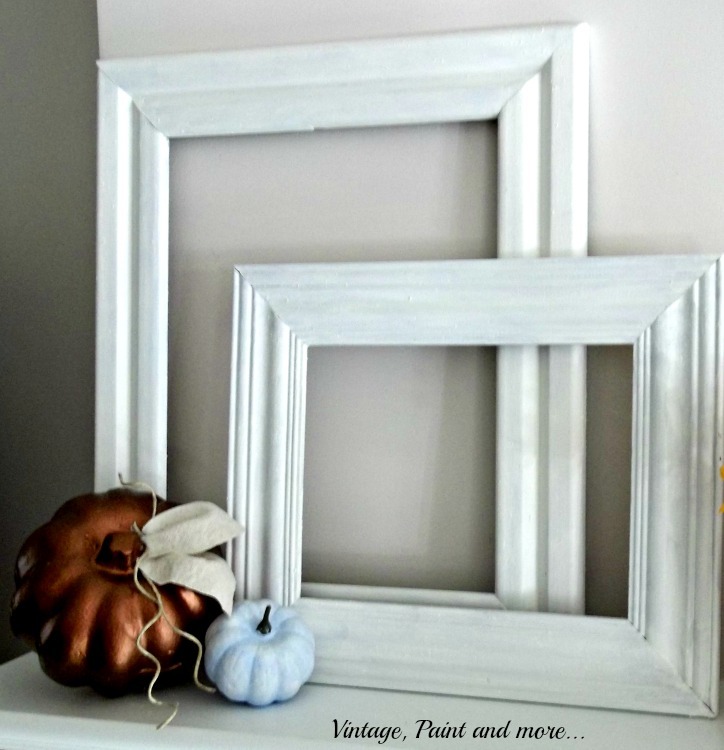 I love the idea of using white frames with pops of autumnal color against them - very nice! I love the simplicity of the mantel with muted colors and the contrast between the shapes. The wreath is spectacular. My fall mojo has arrived, but I have had company and been playing instead of decorating. I take my daughter to the airport today so maybe I can get some things done. Everything looks wonderful at your house. Cathy, this looks fantastic and I definitely know what you mean about planning something and having it go in the other direction!! In this case it works! And you still have a lot of sparkle. I just don't know what fall would be without color. I have to see how you paint those jars, I really love those. And I never thought to paint pumpkins! I love the empty frames. I painted some a few years ago and hesitated putting them up, too! lol! No one said anything, that worried me a bit. Maybe they have just accepted how weird I am!! lol! Stopping by to let you know I am featuring your pretty mantel tomorrow on Made in a Day! Thanks for linking up! Love your mantel - your wreath is perfect! Your photos are fantastic - wonderful vignettes! Enjoyed your mantel. Great buy on the frames. I never pass one up. Very cute! Thanks for sharing at Redoux! I loved this so much I featured it at DIY Weekend today. Don't forget to link up this week's projects. Thanks for the crafty inspiration! What a beautiful mantel! I love how simple it is! 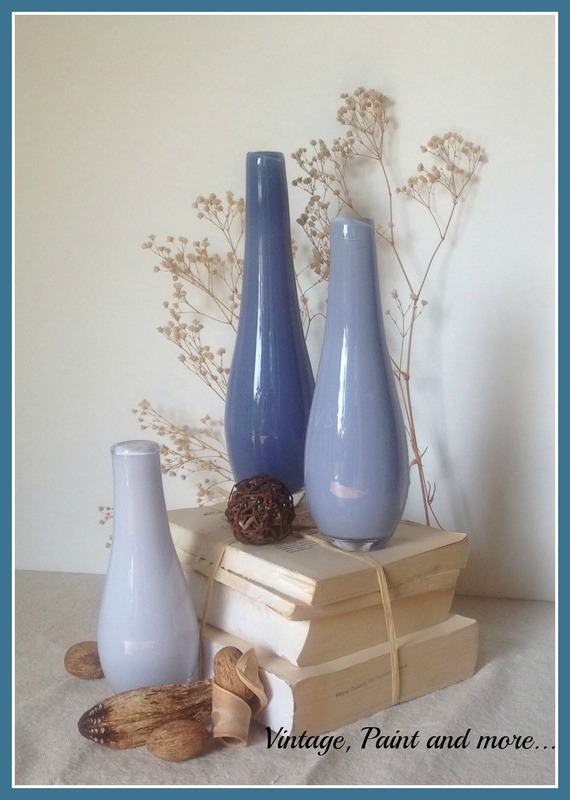 Just gorgeous :o) Thank you so much for linking up to The PINcentive Blog Hop! Happy Friday and I hope you have a wonderful weekend! Thank you so much for sharing with us! Hope you are having a fabulous weekend. Thanks for sharing the beautiful fall mantel at the Krafty Inspiration Thursday Link Party, you have been chosen as one of the top 5 featured posts at tomorrows party.